Got a website created for the project hopefully a bit easier for people to navigate around and keep up to date with. Still pending some trailers and things which I will be adding soon. Last edit: 26 Mar 2016 17:32 by tks. Fantastic! I'll be keeping my eyes on it. Any comments or reviews on the new bionic film? canarysong wrote: Any comments or reviews on the new bionic film? I saw it and thought it was well done.....there is a great scene of the girl crushing the guy's hand, and she TOTALLY nails the expression and attitude of the moment. Was the best part of the video, IMO! Bookmarked also for easy referernce. Can't wait for the "Our Girls" section to get filled out. Wow, great job on bionic film!!! I'm so in love with this bionic girl, please tell me we'll see her again soon ? She's super strong and she look strong too, great attitude, hope she will use her bionic strength again in a lot of situations. Suggestion: made her impress a friend (or a new boyfriend) with her power! Another batch of Kudos to Lfan and Fats for their wonderful work in creating it. Couple of previews of an up'n'coming one. 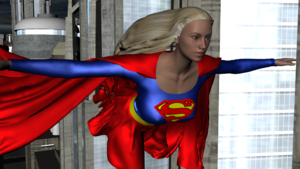 Currently in production for a bit of a longer superhero/super strength/girl power. A few people have said they'd love to see a more feature length offering so this is what we're trying to do. Now obviously the big thing with something like this is Funding so I'm thinking of launching a crowd funding campaign to go along with this and I wondered if this was something I was to try and do what people would like as the rewards? So far some suggestions I've had that are likely to happen are. Pre-buy the film at a discounted rate. Pre-Buy a section (will likely be split into 2/3) at a discounted rate. Are there any other things people would like? And do people think the above are good Ideas. The film itself will be pre-written. After some discussions with people who've done it before the "buying you own feats" seemed to end up with a messy project that didn't work. It will contain lots/most/all of the elements that people would love to see. You'll of course be able to see the script before shooting. Any suggestions on here is good or if you'd rather you can stick it in an email. remember this is for prizes/rewards not ideas for script/story/feats. Last edit: 27 May 2016 12:33 by tks. It is indeed and wonderful she is too!! Last edit: 27 May 2016 15:12 by tks. I will definitely participate in the crowdfunding and go for the Extended/unedited Superbreath Scenes! Thanks for all the great clips! Keep them coming! TKS, are these feature lengths a part of The Gallent Series or are they separate? Hey gomaller. They will be part of the gallant series but they will each be stand alone movies with their own complete and unique storylines. tks wrote: It is indeed and wonderful she is too!! I thought the actress from "The Forger" was excellent (there is a great bit where she taunts the guard for being too scared to attack her) and always thought it a shame that she never made any more movies in the genre. Really good to see her back then, especially as it looks like an armwrestling scene is featured! Apologies as always for double posting but website updated!! What are the chances of turning some of the works on this site into a film, specifically....Serena's Lucky Day?